Collectors of Roseville pottery typically start out without a specific collecting goal or objective. It often begins innocently enough by inheriting a piece of Roseville pottery or finding a piece you can’t live without at an auction or show. Others are simply looking for the right arts and crafts piece of Roseville pottery for interior decorating purposes or to accent their mission style furniture. Regardless of how it starts, collectors of Roseville pottery usually eventually decide upon a particular goal. Common Roseville pottery collector goals may include collecting an entire line of Roseville such as blue Pinecone, green Apple Blossom, or Sunflower. For example, we are working with multiple collectors who are focusing exclusively on completing their collection of a particular Roseville pottery line. Roseville pottery wall pockets are another common collecting theme for many Roseville collectors. 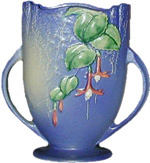 There are numerous collectors attempting to obtain examples of each Roseville pottery wall pocket produced or what they consider to be the top 50 Roseville wall pockets. Other collectors are seeking to add an example for each Roseville pottery line to their collection. An additional Roseville pottery collecting theme includes collecting only 3” Roseville pottery jardinières in each color and pattern to focusing exclusively on Roseville flower frogs. Still others choose to focus on collecting only examples from Roseville’s middle period patterns such as Roseville Blackberry, Baneda, or Sunflower. Ultimately there is no right or wrong way to collect Roseville pottery or any other antique art pottery. There are as many ways to collect Roseville pottery, as there are examples of Roseville pottery produced.